| Weak script and big budget handed to an incapable director! See a lot of guys giving this a one out of ten, not really fair I feel. To me there are lots of worse movies in all categories. But that said - it's not a top notch movie. I've never been a fan of director Ron Underwood - he might be decent for TV but features aren't his strong side in my opinion. You'll notice best when it comes to the comedy parts (the attempts I should say) and the actions sequences. As for comedy, the directing does nothing to enhance the seemingly weak script. Since comedy seems to be what this movie was to be about and the pace seems intended to be rather fast - maybe they should have gone for a director who could make something out of it? The action sequences are incredibly lame. It resembles grown people playing war without saying "pow pow". Here the director's at a loss as well, which shows in sequences as when Randy Quaid's robot character is taking out his two canons for guns. I take it, this is supposed to be a "cool" shot but the angle of camera, timing and pace makes it about as cool as when your dad hangs up his coat upon returning home from work. The budget ($100 million allegedly) didn't seem to be a problem and the special effects as well as the sets seem pretty well done, along with a pretty nice cast (even tiny sub-minute parts are mostly done by actors you at least recognize). This must be seen as further critique of the director, since he seemed to have all the necessary tools at hand. The actors put in from a half-hearted to a decent effort. A lot of great character actors (Joe Pantoliano) didn't get enough space to be interesting and there is a lot of untapped comedy resource in both Jay Mohr and Eddie Murphy. Though it has to be said  Pam Grier put in what has to be her worst performance ever as the mother of Eddie Murphy's character. One you can always trust to give his spirit is Luis Guzmán, and he doesn't disappoint in this one either. All in all I would say there was a weak script to start with, that grew even weaker when it was handed to a director that couldn't handle the sort of comedy it was supposed to be, nor the action it was supposed to contain. Probably actors underachieved, especially in the comedy department, due to this directing. The end result was nor a comedy, nor an action  simply a bleak sci-fi that was one of the biggest net-losses in movie history if I got it right. My guess is that the guys at Warner Brothers probably are killing themselves for not picking a more suitable director. The workprint version of the film ran nearly three hours, and Oscar-winning editor Alan Heim was brought in to try and fix the film. After viewing the available footage, he determined that a large portion of the film needed to be reshot, and whole new scenes added including an opening and closing sequence, and introductory sequences for both Pluto and Dina. 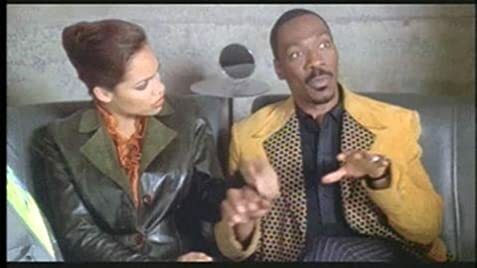 Eddie Murphy ultimately financed many of the reshoots while the film languished in post-production, writing and directing many of the new scenes himself. Pluto Nash: That's a cryogenic Chihuahua! Dina Lake: It's a real dog? When Pluto Nash finally meets his "twin", he has a black tie and his twin has a red one. In the next shot they both are wearing black ties.